This adorable monkey themed birthday party was submitted by Karen of Piped Dreams. 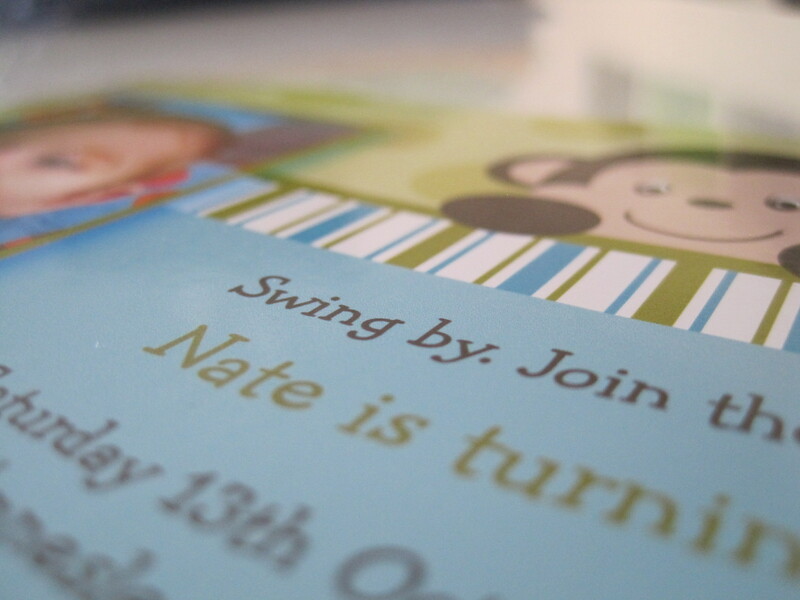 A monkey party theme truly reflected her little boy in every respect and was ideal for his first birthday. 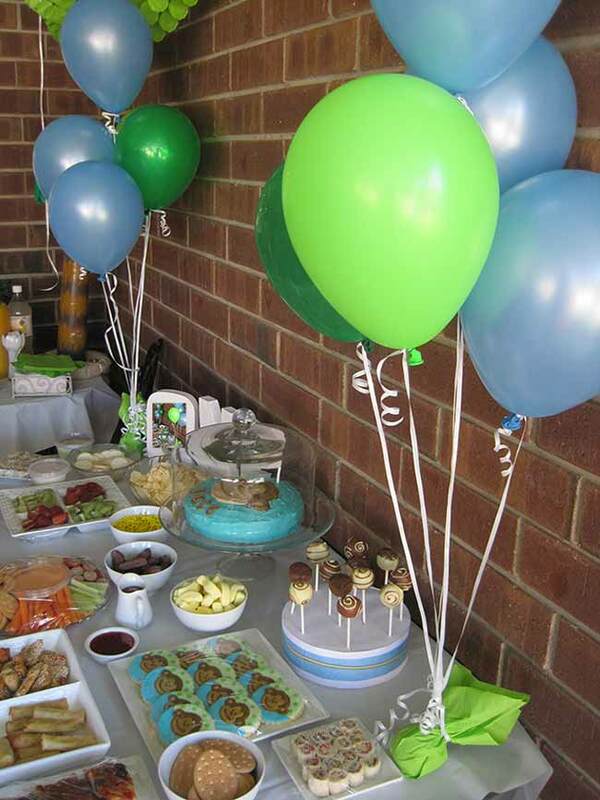 What a fun party theme that any child would just adore. This theme would also be super cute for a baby shower! Karen said about planning the party “Nate is such a cheeky monkey, how could I do anything else! He had also been given a number of monkey toys over the past year, which he absolutely loved, so it seemed like the ideal party choice. I spent some time looking around for decorations to fit the theme and purchased most items from Spotlight. I decided to keep the food for the party pretty low key, but made the cake and the cookies to match the invitations”. So how was this adorable monkey themed birthday party put together? Firstly, it is important to choose a theme that reflects who the party is for. The monkey theme was perfect for this cheeky little monkey. Once your party theme has been chosen, you can select your invitations. The invitations really set the scene. These invitations were personalized with a photo of the gorgeous birthday boy. The decorations reflected the first birthday party but also the earthy colours to match the monkey theme. The decorations worked perfectly together. Several monkeys were hidden throughout the backyard, which provided a great counting game for the kids! Some simple streamers gave a forest feel. By giving some thought to the food and drinks that you are going to provide, you can create an impressive spread with little effort and without going over your budget! Karen made the cookies and the cake, and complemented the design beautifully. She also kept in with the colour scheme of blue, green and brown. If you would like to know how to decorate a cake to look like this, you can do so here. It is traditional at kids parties to hand out party favours at the end of the party to thank the guests for attending. This can include anything that you want it to, but traditionally it will have a few sweets and small toys. The party favours were again tied in beautifully with the monkey theme. Does this make you want to hold a monkey themed birthday party for your next kid’s party? If you would like some monkey party printables for your next party, you can download some printables for FREE here. If you like this post, please share it with your friends and family. You can also subscribe to Smart Party Planning to be kept informed of future updates! Planning your own Monkey Party? Check out these party supplies to help set the scene…. « Need a Healthy Party Food Option? Birthday parties are very special for kids. So to make the party more memorable we must try innovative ideas. The party should have a theme and you need to reflect it on every item beginning from invitations to cakes,decorations etc. I like the above monkey theme and kids will surely enjoy a birthday party like this. Thanks for your comment Stacy. It is nice to have a party theme as it does make it that little bit extra special and unique! As for the monkey theme, whether the party is for a boy or a girl, you are right…the kids will love it! This party is adorable! I’m wanting to do something similar for my little monkey’s first birthday. I especially loved the invitations! where can I find them?? Thanks! !